OUD-BEIJERLAND – The Dutch manufacturer of shock absorbers KONI has managed to increase order picking accuracy to well over 99 percent while simultaneously increasing replenishment speed by a triple-digit number using Glass Enterprise Edition and Ubimax xPick. 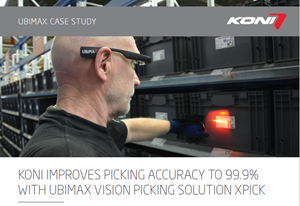 KONI and Ubimax joined forces and integrated the new wearable device Glass Enterprise Edition in KONI’s internal logistical process, with a twenty percent improvement in efficiency as a result. The Dutch headquarters in Oud-Beijerland, the KONI center for innovation, research and development, recently has implemented an innovation to optimize the internal logistics to the shop floor. KONI teamed up with Ubimax, an IT company which specializes in wearable computing solutions, to develop a new shop floor replenishment system. Wearable devices are increasingly used in the logistical and production processes of large companies. For instance, with the help of Glass Enterprise Edition, order picking can be done in less time, with more efficiency and thus more cost-effectively. In the last six months KONI has been collaborating with Glass’ German software partner Ubimax. Glass Enterprise Edition and Ubimax xPick made it possible to implement a closed-loop supply chain from the warehouse to the production lines and back. The results were incredibly positive. The replenishment speed of the parts to the production lines increased with 1600 percent. Furthermore, Glass Enterprise Edition enabled KONI to switch to just-in-time order picking, which reduced the number of parts stocked on the shop floor by 98 percent. Now parts are delivered within fifteen minutes to the exact location where they are needed. At the same time, remainders are sent directly back to the warehouse. Thanks to Glass Enterprise Edition the order picking process is now 99,9 percent accurate. Also, KONI can access real-time stock information . The fact that Glass Enterprise Edition enables to reduce the error rate close to 0 percent makes it a very powerful system. Another improvement has been achieved considering the daily walking distance of operators who process the parts on the production lines. Before, they had to walk a small distance every time they needed to collect the components they needed. Now those components are delivered so accurately, that the average operator’s walking distance is reduced by 4 kilometres every day. In the last couple of months KONI managed to improve its efficiency by 20 percent, in large part thanks to the implementation of Glass Enterprise Edition. With over 150 years of experience in shock absorbing solutions, KONI has the know-how to optimize a vehicle’s driving, feeling and handling. Operating on all continents, KONI shocks are supplied to the world’s markets through a vast number of local distributors. KONI develops, manufactures and sells hydraulic shock absorbers and systems for street and racing cars, buses, trucks, trailers, railway rolling stock, defense and industrial applications. Since 1972, KONI is part of ITT, a global diversified industrial company with employees in more than 35 countries and customers in approximately 125 countries. Clarissa Boomgaards - Marketing & Communications Specialist, KONI B.V.